With the availability of so many free or affordable e-reader programs and devices for both Mac, PC, and mobile device users, you can find some good free ebooks – especially classical literature – to download and start reading in a matter of a few minutes. With Kindle being the most popular of e-readers Which Is The Better Reader - Kindle Vs iPad [Geeks Weigh In] Which Is The Better Reader - Kindle Vs iPad [Geeks Weigh In] Read More – both in its software platform for Mac, PC and mobile devices, and its hardware versions – many websites have popped up to provide free downloads of what is called the Kindle or .mobi formats for Kindle e-readers. First off, if you don’t know how to download free Amazon Kindle ebooks to your PC, check out Karl’s article here How to Download Free Amazon Kindle eBooks to Your PC How to Download Free Amazon Kindle eBooks to Your PC Even if you don't have a Kindle, you can still download free Kindle ebooks to read on your PC. This article eases you through the process. Read More and see my article Reading Ebooks on the iPad With iBooks & Amazon Kindle [Mac] Reading Ebooks on the iPad With iBooks & Amazon Kindle [Mac] Read More about how to add and read Kindle books on your Mac and Apple mobile devices. Before we delve into the 5 other online sources for Kindle books, let’s remind ourselves that Amazon.com has a section of free ebooks – mainly older, out-of-copyright and pre-1923 books – that you can browse and download to your Kindle. Popular current features include Leo Tolstoy’s classic War and Peace and Jane Austen’s Pride and Prejudice. Amazon’s free ebooks listings are easy to browse and download. You can sort the list by Bestselling, Avg. Customer Review, and Publication Date, and Price: Low to High. ManyBooks has a well organized listing of popular free ebooks, including the mobile format. A good place to start browsing on this site is its Categories page which lists over 60 genres of books – including Adventure, Banned Books, Fantasy, Politics, Satire, and Science Fiction. When you select a book, you need to click on the accompanying pull-down Download button to get a list of ebook formats, many of which include .mobi. 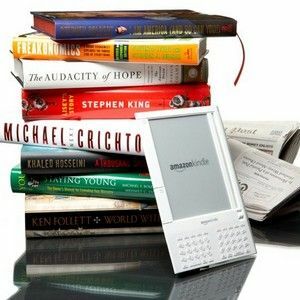 FreeKindleBooks is not a visually appealing site, but it too offers thousands of Kindle-compatible ebooks in the classical category. This is the site you go to if you‘re looking for books by writers like Charles Darwin, Emily Dickinson, W.E.B Du Bois, F. Scott Fitzgerald, Homer, Sarah Orne Jewett and William Shakespeare. Titles on this site do include book cover images. When you click on a title, the linked .mobi version, like the above image, will download to your computer or mobile device. MobiPocket has over 116,000 listings. What sets this site apart is that it includes Kindle books in various international languages, including French, Spanish, Portuguese, Danish, and Russian. Book categories include Juvenile literature, US politics, Criminology, history and the like. Unfortunately, listings don’t include descriptions beyond the author and title. If you’re not finding what you’re looking for on any of the sites above, you might try the search engine, JustFreeBooks. This site searches over 700 websites for free listings. The search results for titles will include the available formats of ebooks, including Kindle .mobi. Established in 1971, Project Gutenberg has the largest single collection of free electronic books on the Internet. You mainly search by title and catalog to find ebooks on this site. But you also can check out its Bookshelf listings, which includes 80 different categories of ebooks. If you’re an avid reader, you could easily spend hours on this site. Clicking on a title also brings up listed ebook formats. There’s also a link to read ebooks online. These are the free Kindle ebook sites I found the most well established and easy to use. If you know of other sites that should be added to this list, please let us know about them. Explore more about: Amazon Kindle, Ebooks, eReader, Reading. http://kindlefreebooks.co.uk - links to Amazon and others - a new free and low priced kindle book listed every day! Jeff, thanks for sharing this. I experienced this problem last year when I was trying to finish the reading of 50 books in 365 days. I couldn’t believe how sometimes it was difficult for me to figure out what to read next, though I have a lot of books in my library. Thanks, Colette, allindoc, Alex, Andy. Appreciate what you added. Many public domain books available in .mobi.